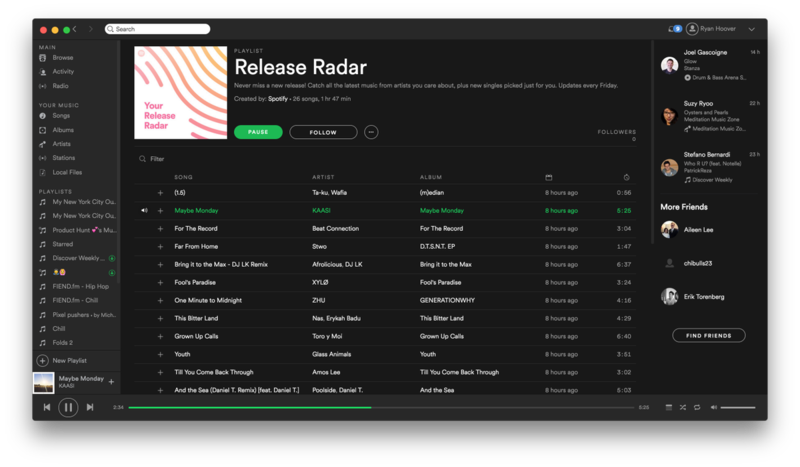 Would you recommend Spotify Release Radar to a friend? Sometimes get releases wierd unknown bands with the same names as my favourite ones. Happened 2-3 times in a year. Eugene Dugaev has used this product for one year. @rrhoover Wow that's amazing! How's it built? Based on my followings or, more like Discover Weekly, based on my history and EchoNest algorithms? @hfauq @rrhoover I don't know how it's built but I have the exact same playlist than Ryan when I click on his link. Which is pretty weird cause I think it should be a unique playlist generated by Spotify for me. Am I wrong? @pierrickgt: Not the /user/ tag in the URL. You're checking his personal playlist. If you want yours: go to Browse, then you'll find the Release Radar there. Hit Follow & done! @hfauq: Seems like Discover Weekly. I have artists in my playlist that I don't follow... although I think this is more weighted towards followed artists than Discover Weekly. @basgras well to me, it looks like Spotify is the user. Since the url is /user/spotify/playlist. For example if you want to access my weekly playlist, you need to use this link: http://open.spotify.com/user/spo... So it's the encrypted part at the end that is the actual playlist. @basgras I use an IFTTT recipe to do the same for Discover Weekly, thanks for this! Is it available for everyone now? I'm not seeing it.